The Classy Geek Spring Forward Giveaway! | It's not your tech, it's how you use it. Spring has sprung, we all lost an hour to the laughing ghost of Benjamin Franklin, and temperatures are starting to rise in most of the northern hemisphere (and especially here at my home in the Ray Ban outlet United States) which means one thing: spring is coming, and there’s nothing any of us can do about it. Along with the beautiful leaves and flowers and blooming trees and the eventual need to shed our heavy winter coats for something more manageable and cool, we’ll soon return to the topics of clutter, travel, spring cleaning, tasty beverages, and making the most of the spring and summertime. Before all of that though, I want to make sure you’re paying attention – there are some great things coming from The Classy Geek very soon, so stay tuned! One of those great things? Well, this giveaway! 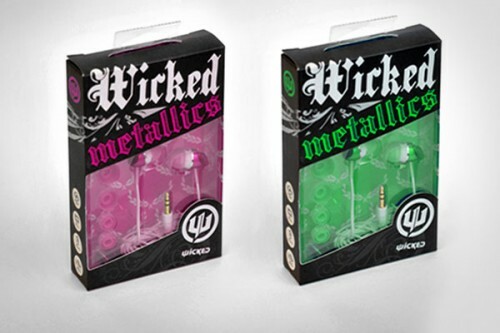 We’re partnering with Wicked Audio to give away a set of Wicked Metallics earbuds, and all you have to do is leave a comment below (with a valid e-mail address so I can reach you) to win! I’ll pick a random commenter that leaves their note between now and 11:59pm EDT on Monday March 28th, 2011! Can't wait to hear more about the subjects mentioned :) Also can't wait till Spring really arrives! Here in the Pacific Northwest area, it feels like the weather is pondering a change to spring, but hasn't quite committed yet. Those are some sweet colors! I would love these! Thanks for the awesome giveaway! Might as well give it a shot; I like Wicked 'buds. Wicked Audio rocks. Count me in. I love the warmer weather in Denver, Colorado, the potential for blizzards, grass turning green. As long as I keep antihistamines nearby, I'll be just fine! Can't get that hour back but Wicked Audio headphones would be sweet. Thanks so much for the entries so far everyone! Best of luck to everyone, and keep em coming in! With this kind of response, we'll definitely do more giveaways very VERY soon - I'm going to be sad to only choose one winner! I dedicate this entry to the snow that spring has greeted me with. Cute! The packaging is very nice indeed, as are the earbuds. Thanks for the chance!